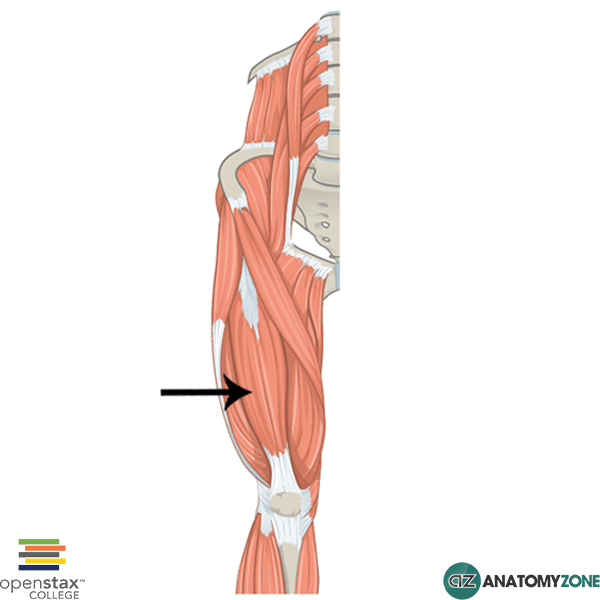 The structure indicated is the rectus femoris of the quadriceps group of thigh muscles. The rectus femoris is one of the muscles that makes up the quadriceps femoris, and is contained in the anterior compartment of the thigh. The muscles of the anterior compartment are all innervated by the femoral nerve and serve generally to extend the leg at the knee joint. The reflected head attaches above the acetabulum, whereas the straight head attaches to the anterior inferior iliac spine. It is important to note that the points of origin for the rectus femoris muscle mean that the muscle traverses the hip joint, unlike the other muscles of the quadriceps: this means that the rectus femoris additionally has action at the hip joint and is a weak flexor of the hip. Origin: Straight head – from anterior inferior iliac spine. Reflected head – groove just above acetabulum. Action: Flexion of the thigh at the hip joint. Extension of the leg at knee joint.